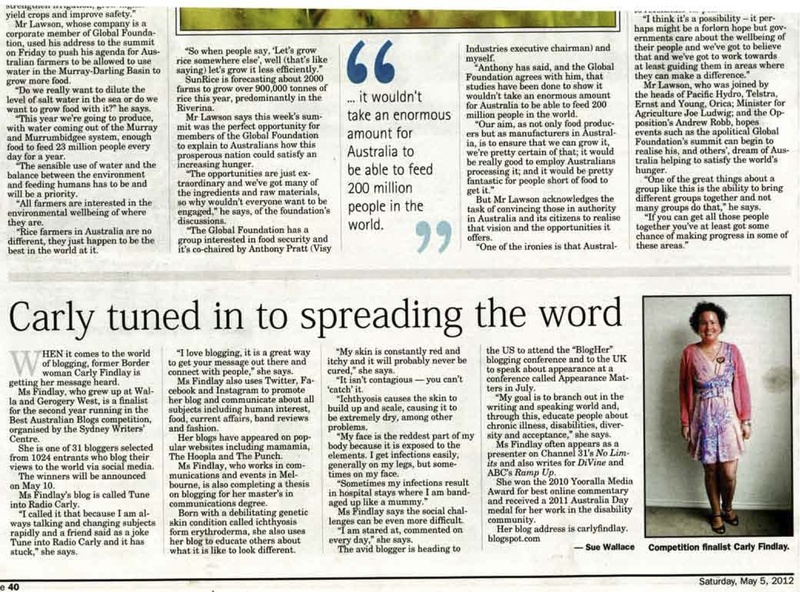 Tune into Radio Carly: The Age newspaper article! I am in it! Hello! Yesterday was an amazing day! It is like I live in parallel worlds these days! I spent the morning talking to a journalist and having my photo taken by two lovely men. It was press for The Other Film Festival, where I am a judge. Then I went to work at my day job, doing day jobby things. And then I put on my sequined dress, felt a bit uneasy looking like a disco ball at my desk at 5.10 pm, logged off my day job computer, amd went to The Other Film Festival opening night with Jess and Louis as my plus ones. We drank champagne, watched some amazing films - Deaf Mugger, Agalee and Aphasia (all breathtaking), and I practised my schmoozing with festival patron - animator and Oscar winner Adam Elliott and star of Aphasia, Carl. Someone I know out-schmoozed me. Must work on my technique! My friends laughed at me. I laughed at me too! I am featured in The Age newspaper today. If you can't get a copy, you can read it here.That photo above is by Simon Schluter. He asked me to drape on the couch. We were in fits of laughter because my jeans and skin were restrictive which meant I wasn't very drapey. And then Rick sat on the couch and we were laughing even harder. It was fun. 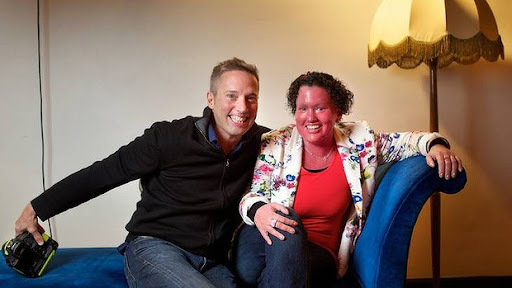 The interview centres around Rick Guidotti and I. He was a fashion photographer to the stars, being told what beauty was every day. Then he saw some photos of chiildren in medical books, their eyes blacked out, they were defined by the name of their illness or disability. He wanted to showcase their beauty, to take photos of them in their natural environments. And so he founded Positive Exposure, which does just that. He was so much fun yesterday - he told me I am stunning! I will be having some photos taken by him on the weekend. Listening to him speak was very insightful - he is making a difference to the way society sees beauty. I think he is my hero. If you are reading this, thank you. Thank you again for all of your support. I am so lucky to have this life, and I am so grateful for you sharing it with me. Luck has nothing to do with it. I'd call it "pluck." You may be lucky to be experiencing all this but you have worked really hard for it too! That is a great shot, you look fab in your new jacket. Amazing! I love that you are getting so many incredible opportunities coming your way - you have totally earned them, you work so hard! I'm going to have to look up some of Rick's photography. His project sounds incredible. P.S. Your outfit is super cute. I just checked out Positive Exposure, what a fantastic program! Great photos.